There are many reasons why individuals loan money whether it is from banks, lending companies, or even from close friends. Some of the most common uses for it could be for supporting education, or to purchase a car or home. 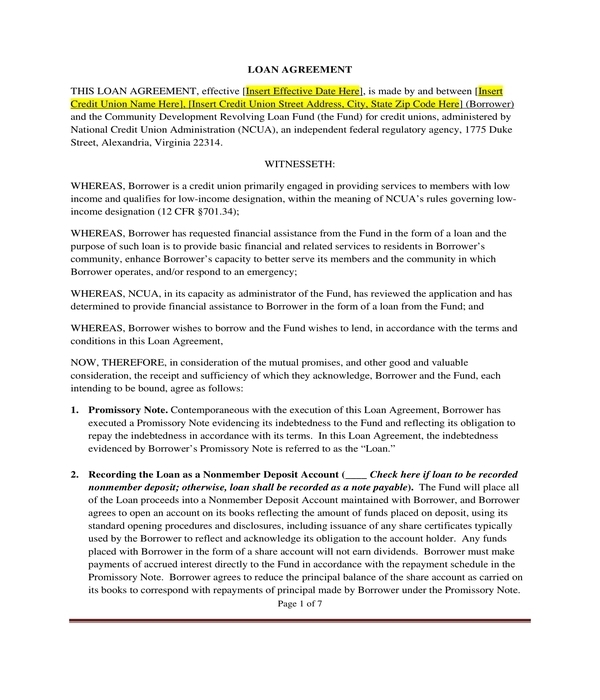 But what really is a personal loan agreement form? 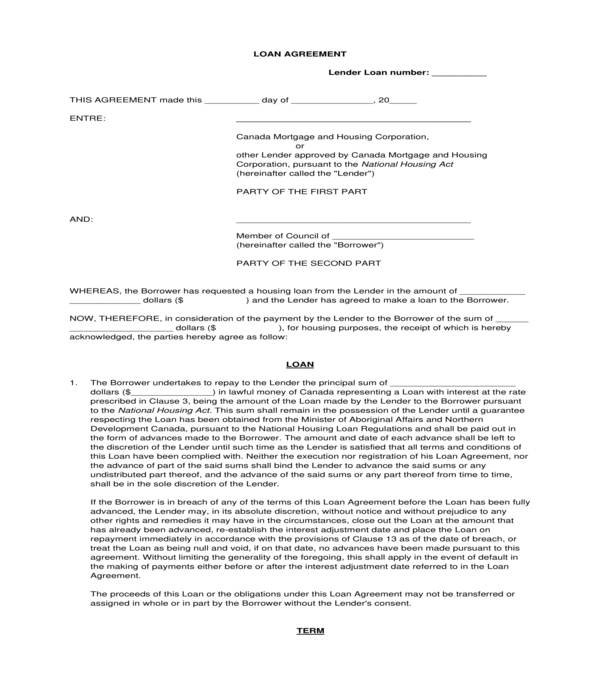 A personal load agreement is a written contract that involves two parties, which are the lender and the borrower. This agreement allows for the protection of the involved parties and is most likely created by the lender. This details regarding the amount of money that is requested to be borrowed, the terms of payment, and the length of time the borrower has until they must repay the loan in full. 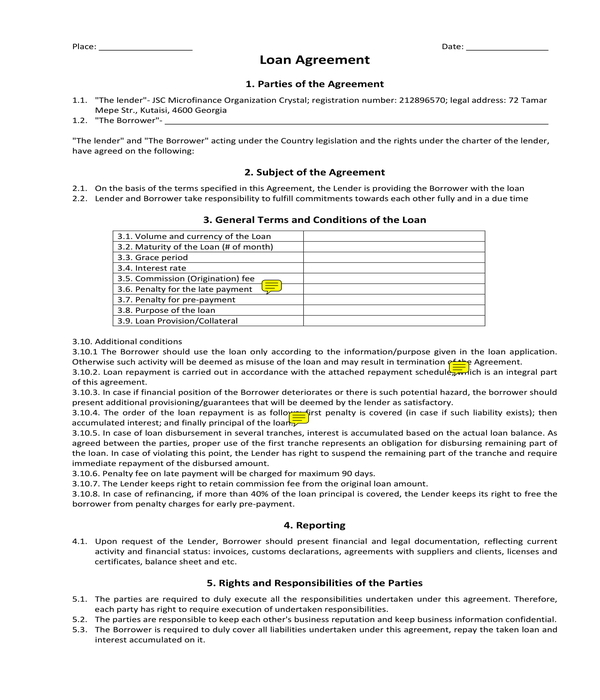 The intention of a loan agreement is to place descriptions on what is being loaned, when the borrower has to repay it back, and includes how the borrower is paying the loan back. Once the personal loan agreement has been executed, it is basically an assurance to pay from the lender to the borrower. 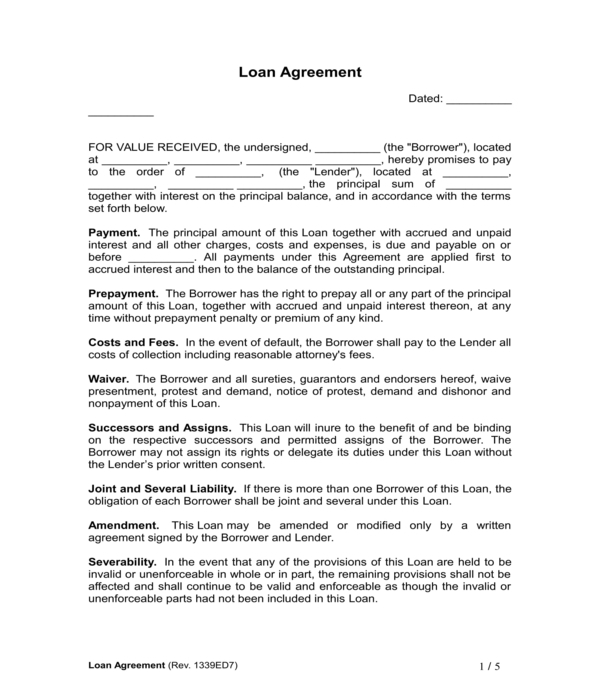 Understand the purpose of a loan agreement: Because a loan agreement is a formal proof of the agreement between the lender and the borrower, it is important that both parties are protected in case the lender and borrower may later have a dispute with respect to the borrowed funds. Loan agreements must inform both parties with how much money is borrowed, the terms of payment, and what would happen should borrower be late with payments or does not repay. Affirm your decision to lend to a borrower: Before ever lending money to the borrower, lender must assure themselves that the borrower is able to pay back the loan. On a personal level, you may be able to trust your instincts regarding the borrower’s credibility regarding repayment. But you may also ask the borrower for proof of creditworthiness. This can be through a credit report, proof of income, and work references. See also, IRS Tax Forms. Settle on an interest rate: The interest rate is a very crucial element in any loan agreement. For different states, there are different limits to maximum amounts you can charge in interest, which as called “usury” law. Make sure you do not charge more interest than is allowed by your state by researching on your state usury laws. You must also at least charge the applicable federal rate as required by the Internal Revenue Service. Discuss and bargain with the party regarding the terms: An agreement always honors the arrangement the parties have reached. Appropriately, discuss ahead of time, and concur regarding the amount and the loan and repayment. 1. Interest: The most important clause in a personal loan agreement, there are two predominant types of interest rates, which are the fixed fee rates, and the floating free rates. Fixed fee rates are set at a given number, which will not be adjusted during the course of the loan. Floating free rates are based on an interest rate margin plus a benchmark rate. 2. 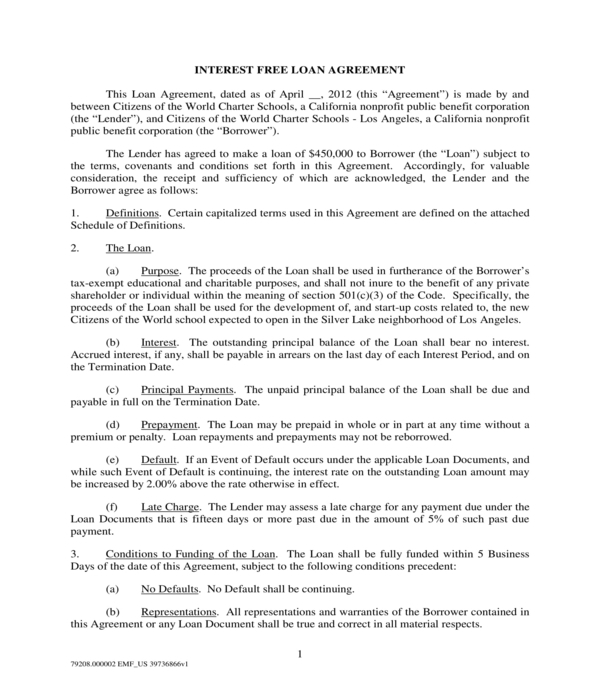 Default Interest: A default interest clause is also included in a well-drafted loan agreement. The interest rate increases which is payable on amounts which are not compensated when they fall due. The default rate should precisely reflect the amount to the lender of the amount not being compensated when due. Should the rate be disproportionate, the risk that it can be considered a “penalty” rate, which makes it unenforceable. 3. Prepayment: It is crucial that a loan agreement permits the borrower to repay the loan early, which make the loan more flexible. These prepayments must only be granted at the end of an interest period in order to avoid any payment of breakage costs. In particular situations, a loan agreement must also require a compulsory prepayment. 4. Events of Default: One of the key elements of a loan agreement is whether it is repayable on demand or is repayable only at the end of a fixed term. There is no need for an “Events of Default” clause should the loan be repayable on demand. This is because the lender can recall the loan ad libitum, which means that it is not necessary for the borrower to be legally obliged to maintain particular covenants. Should the load be a fixed term loan, then the inclusion of an “Events of Default” clause is necessary. An Event of Default is commonly an event which puts the borrower into default. The description of an Event of Default makes it critically important, and will develop depending on the type of loan the parties are entering into, the stance of the parties, and a variety of factors. 5. 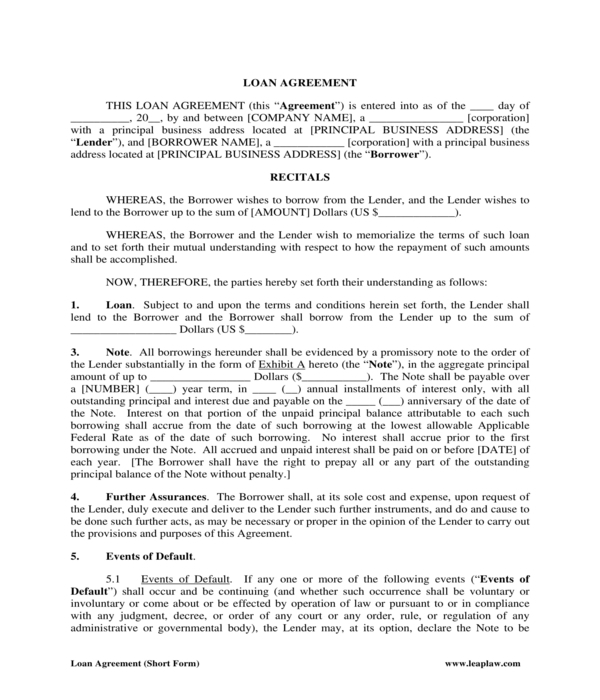 Committed or Uncommitted Loan Agreement: A loan can one or the other be committed or uncommitted. 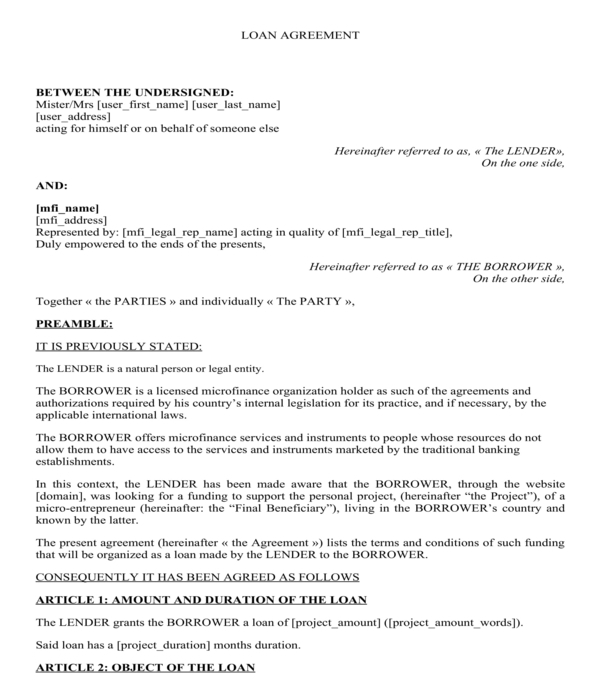 Should the loan be committed, then the lender is legally compelled to lend the loan amount to the borrower when certain Conditions Precedent have been fulfilled. These Conditions Precedent will be established in a schedule to the loan agreement. It is not necessary to have a Conditions Precedent schedule if the loan is not committed. 6. Repayment: This term talks about points that relate to the repayment provisions of the loan agreement and whether or not the facility is to be repaid on demand or on a set schedule. In most cases, the parties involved in a loan agreement will recognize a fixed repayment schedule, but every now and then, the lender may assert on an on-demand facility especially if the borrower has poor credit. 7. Secured or Unsecured: Most loans are secured against an asset, but in certain situations the parties involved may agree to not securing the facility. This often results in the increase of the lender’s risk, which will have a domino effect on other areas of the agreement. 8. Bilateral or Syndicated: The most common in simpler, more basic transactions is a bilateral loan. A loan will commonly only be syndicated if the lenders are investment banks or corporate and the amount lent is quite significant. With the aforementioned points mentioned, we now understand that personal loan agreements allow for a consensus between a lender and borrower in terms of loaning cash for specific needs of a borrower. This allows for a harmonious relationship between the lender and borrower and avoids future conflicts should borrower miss due dates for payment. What Is a Loan Verification?